Over the past weekend, at the National Speech and Debate Association’s 2016 National Tournament, Santa Ana Councilman Tinajero was announced as the recipient of the Harold C. Keller Award, a top honor provided to individuals for their dedication and development to speech and debate. This great honor comes on the heels of Councilmember Tinajero’s retirement from being Director of the Fullerton Union High School Speech & Debate Team earlier this June after 15 years of dedicated service which included over 170 speech and debate tournaments, coaching of over 1,000 students, and numerous other prestigious accolades. 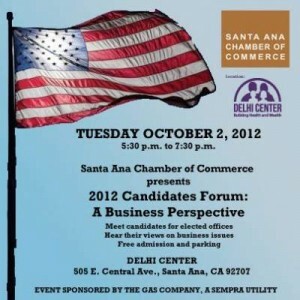 Don’t miss the 2012 Candidates Forum that will be hosted today,.from 5:30 pm to 7:30 pm, by the Santa Ana Chamber of Commerce, at the Delhi Center, which is located at 505 E. Central Ave., in Santa Ana.